Well we leave shortly for our trip and as I had a feeling that I might not mange to finish all of my must do tasks I even arose early this morning and started my sewing. 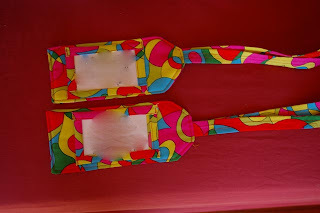 Now you may mistakenly believe that I started sewing the ski pants which I plan to live in for most of the trip but no.. there was something even more urgent....luggage tags. I have wanted some bright ones for ages and saw some beauties on my last trip but at $17 each thought it was a bit over the top. So now two hours after rising we have our own luggage tags. Off to have breakfast and then hopefully sew some ski pants! Spent the morning surfing the web, avoiding the must do task of making some ski pants for our upcoming trip to Alaska, and found what looks like being quite an exciting new blog, SEWN. Seems it will be an online resource centre for Australian designers, shops, you know whats all related to patchwork and sewing. It is being set up by Sarah Fielke who lives somewhere in Sydney. the site has a launch day of June 1st and a big online party date of June 8th. As I will be away on the 1st looks like I will have to catch up with those happenings when I return but I will be home and hopefully alive by party date. To celebrate the party Sarah is organising a party give away and if you click on the link you will find out all of the details there. For my party I am planning on giving away two gifts. 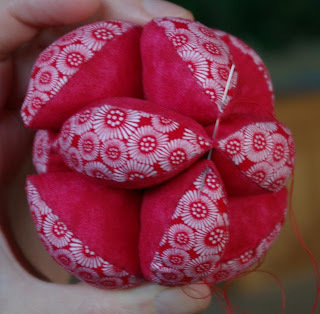 For those who come to my party from Australia you have the chance of winning an oriental pin cushion and for those who come from overseas it will be a donut pincushion (if I find my pattern again otherwise it will be a surprise:), which you will need to stuff. If you would like to join my party simply leave a comment below and remember to check back after the party to see if you were the lucky person. For an extra entry simply create a link back to this blog and leave a second comment with you blog address, this second comment will not be published though. 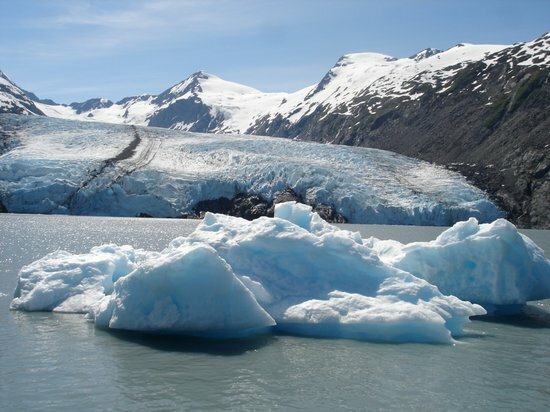 Only seven days to go until we leave for Alaska.... I have to start sewing my pants soon as I only have one pair of heavy weight. Bought a couple of daggy pairs recently and only need to trim the legs down a bit and they will be OK. Have even cut out another pair from some double knit I bought about eight years ago... top of the fashion then. I suppose that is one advantage to being 'old' you don't have to worry about following the fashion. Actually I do follow fashion sometimes. Unfortunately by the time I start to follow them they are no longer fashionable. And if I am actually making the item then there is quite a high chance that it will be fashionable AGAIN by the time I get around to doing it. If it wasn't for the upcoming trip then the 'proposed' ski pants would still be languishing in the proposed pile!. Well I have finally finished all of my notes for my online class with Quilt Campus and have a start date scheduled for September 19th. I was going to start it earlier but as they are only a new online group they are taking it slow and not running any classes over the summer. Funny the things you learn as you prepare for an online class. My photography skills have improved for one thing and I have learnt that my pet hate... paragraphs and sometimes photos splitting onto two pages can't always be avoided because of the myriad of printers which people are using these days. Should be a fun adventure.. can't wait! Ahha another benefit of jumping in quick. I have nabbed a couple of jobs for our retreat which are just perfect for me... co-ordinator of the FQ swap, meet and greet and (the real me task) organiser of the database. Yes I do realise that to most people the last task is BORING plus but I think it is tops to keep things organised and my brain functions that way.